During the nineteenth century the expression plated ware was widely used whenever a second, usually colored, layer of glass was applied (fused) to a primary, usually colorless, gather of glass. Glass of a single color was simply called colored glass. Today the terms cased and overlay have replaced plated ware. Unfortunately, the current terms have different meanings for different people. The term overlay has three different, but related, meanings: (1) It refers to the outer layer of glass on objects that have been cased (Newman 1977, p. 222); thus it has the same meaning as “casing.” (2) It describes the result of the process originally called “flashing” — that is, the dipping of a primary glass object (gather) into a tank of colored glass in order to superimpose a layer of contrasting color. This layer is thinner than that produced by casing (Newman 1977, p. 118). (3) It is used as a synonym for cased glass. Spillman (note 1) uses the term cased glass throughout her account of American mid-nineteenth century glass made in the Bohemian style. She quotes a contemporary account of the making of an exhibition vase that includes the observation: “The most difficult portion of the manufacture of my vase was blowing the casings perfectly even …” (p. 150). Matthews (note 2) prefers the term overlay in his discussion of American Brilliant Period cut-to-clear cut glass. He emphasizes the importance of producing a thin layer of superimposed glass on blanks that were to be cut. Because of this requirement, the technique used during the brilliant period was often (always?) one of “dipping,” not casing. This dipping technique could very well have been used during the earlier period as well, given the difficulty of making casings. Spillman’s quote is for an exhibition piece. To produce a quantity of commercial blanks for cut-to-clear cutting, “dipping” could well have been the usual method. It would have been easier and cheaper than casing. Although it would be convenient if all mid-nineteenth century cut-to-clear glass were cased glass, and all late nineteenth and early twentieth century cut-to-clear glass were overlay glass, things are never so clear-cut in glassmaking! Because the terms cased and overlay are often used interchangeably today, the collector is frequently in the dark as to the actual technique used to produce a blank that was eventually cut (and/or engraved)-to-clear. Is the twentieth century item below an example of an object that has been produced by casing or by “dipping?” Additionally, it is not apparent at first glance, but note that the “overlay” is on the interior of the bowl. If this blank were produced by dipping, it would have been “turned inside out” while in its plastic state, with the colored layer “on top.” The ground and polished pontil of this bowl is in the center of the base on the outside (bottom), as expected. If the blank were cased glass, then a colored gather would have been blown into a colorless “cup.” The two gathers were then fused and “opened up,” with the colored glass on the inside, as in this example. There is no star-cut base on this bowl because, in either of the foregoing situations, this would have involved cutting from clear-to-color (rather than from color-to-clear) and any cutting would be nearly invisible. A star was not cut on the inside of the bowl because the sides of the bowl would have interfered with the cutting wheel. 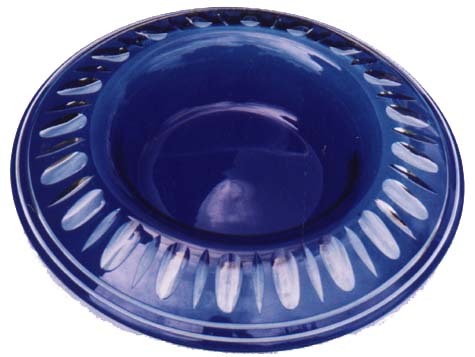 Console bowl, cobalt blue cut-to-clear, on shape no. A1098 by The Pairpoint Corporation, c1920. Cut in the Punty and Vas pattern (Avila 1978, p. 117) which is Pairpoint’s Glenmore pattern without the open diamonds. Ground and polished pontil. D = 13″ (33.0 cm), H = 2.25″ (5.7 cm), wt = 4.5 lb (2.0 kg). Sold for $595, at auction, in 1998. Interior overlays are not particularly common, but they appear from time-to-time, especially on the bowls of wine glasses, where one can mistakenly believe the bowls to be of solid color. Large objects, too, that appear to be made of solid color, will sometimes, upon careful examination, prove to have interior overlays. Spillman (1996, p. 54) shows an excellent example of an interior overlay, which she describes as “cased cranberry over colorless glass.” The object, a claret jug, could easily be mistaken as having been made of solid cranberry glass if the jug were not carefully examined. The writer has had a set of dishes produced in the foregoing manner. While they appeared to be examples of red-cut-to-yellow (as shown by Spillman’s claret jug), the glass restorer discovered a core of colorless glass when he removed some minor rim chips. Double overlay glass of this type is rare. The blanks used in this country for such articles were probably produced abroad, with Stevens & Williams in England and Val St. Lambert in Belgium as likely sources. 1. Spillman, J. S., 1996: American glass in the Bohemian style, The Magazine Antiques, Jan, pp. 147-155.